SMALL WHITE VICTORIAN LANTERN home decor, jewelry, decor, decorations, electronics, fountains, floor mats, art glass, vases, garden essentials, fireplace screens. 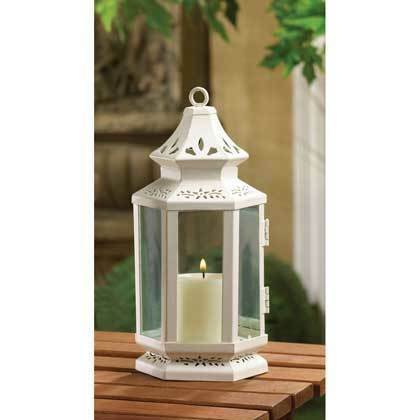 Imagine your tranquil garden at sunset with elegant lanterns filled with twinkling light. Whether placed alone, or grouped with others, this lamp adds a magical ambiance to any evening! Candle not included. Material(s): IRON and GLASS. Weight 0.8 pounds. Dimensions 3.75" x 3.25" x 8".